You know that you should be eating more beans, but let’s be real. Beans can seem pretty boring. Until now! 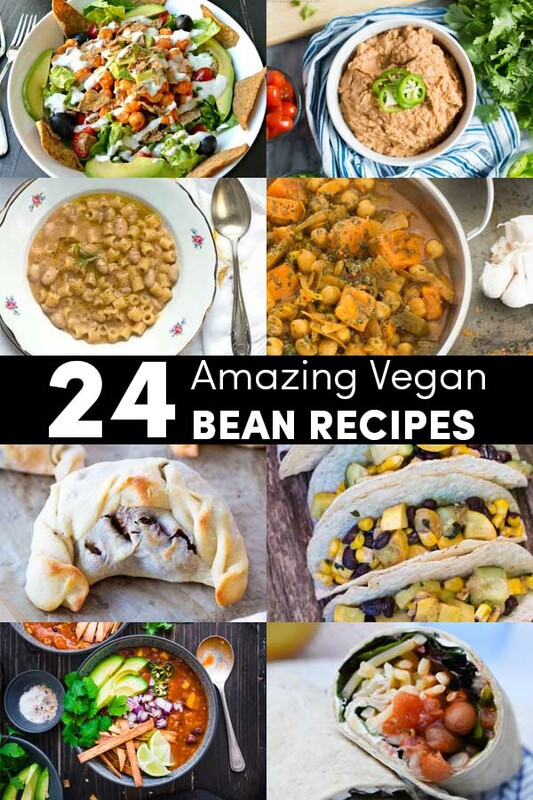 These delicious vegan bean recipes will have you loving that musical fruit. We are not a big beans family. In fact, my son declared a few months ago that he hates all beans. Some prodding got him to admit that there are some beans he likes, but it’s still a struggle to get him excited about beans at supper time. The more I read about the health benefits of beans, though, the more strongly I feel that we need to become a beans family. 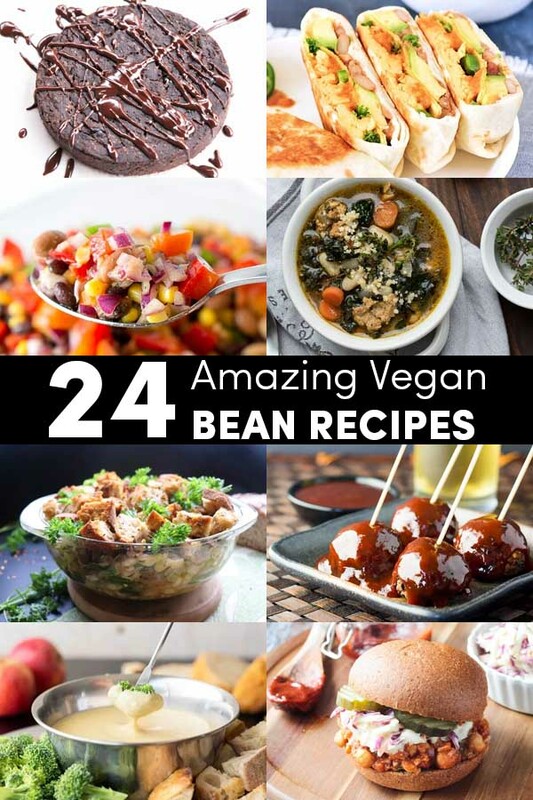 The vegan bean recipes below are my cooking inspiration board, and I hope you’ll find them helpful, too! OK, so my kid has also recently declared that he doesn’t like soup, but if I serve this one with the broth strained off, he will eat it! This cozy, coconutty bean soup is simple to make and one of my personal faves. We eat sushi bowls weekly around here, so I think swapping out our usual tofu for adzuki beans might be a good way to ease into this new, bean-filled life I’m envisioning. It must be the sweet-tart grapes, because my picky kid actually likes this chickpea salad! Perfect for giving your lunches a beany boost. I know: this recipe uses a lot of cans, but you can certainly make the refried beans and enchilada sauce from scratch, if you prefer. What I love about this recipe is that my child actually requests it, and one pizza is packed with a healthy heap of beans. You can also mix up the toppings. I like making this with arugula on top lately, and my family has been loving it! What better way to ease into beans than by fully sneaking it into a dish? White beans are the base for the creamy vegan cheese sauce in this bowl of mac! Like with tofu, I think that people who don’t love beans maybe just haven’t had them prepared well. JL Fields takes that issue head-on with this flavor-packed recipe. You can use these cooking instructions for other dried beans, too, like pinto or cranberry. Dessert hummus is kind of a divisive food, but I am firmly on the pro side of this debate. Mel’s snickerdoodle version of sweet hummus is so delicious, even staunch bean-haters might just love it. I am so drawn to the spicy-savory-sweet flavor profile of this dish! What a perfect meal alongside some noodles and your favorite veggies! I feel like no list of vegan bean recipes is complete without a black bean brownie. This recipe takes that concept and turns it into a super decadent-tasting cake! Pinto beans, scrambled tofu, jalapenos, and homemade Ranchero Sauce make this grab-and-go breakfast wrap super flavorful. This bean and bell pepper salad is a classic, and it’s such a simple way to sneak more beans into your day. Make a big batch on Sunday, and you can stuff your Cowboy Caviar into pitas or spoon it over salad greens for lunches all week long. Look, just because my kid decided he won’t eat soup doesn’t mean I’m going to stop eating soup. Especially one that’s this easy, delicious, and healthy! This flavorful Italian casserole is a great way to use up stale bread and add a dose of beans to your day at the same time. These bite-sized vegan bean balls are such a pretty party appetizer, especially covered in that spicy-sweet chili glaze. White beans make a great, healthy base for homemade vegan fondue. Don’t believe me? Try Jackie’s amazing recipe before you write off this concept! This simple saucy sandwich is delightful for lunch or for dinner. Distract the bean nay-sayers with all of that sweet pineapple and spicy-sweet BBQ sauce! 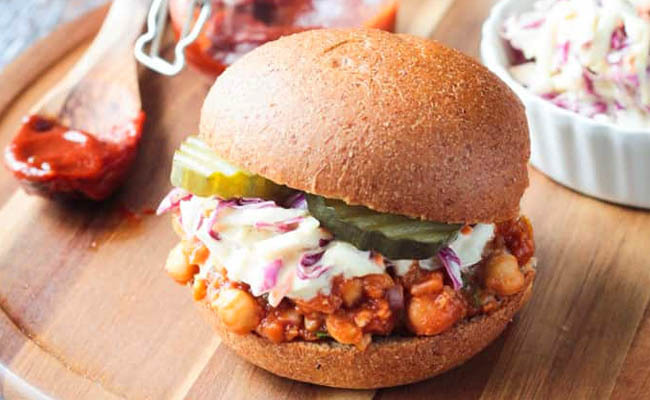 Spicy buffalo chickpeas over crunchy lettuce with creamy vegan ranch is a healthy way to satisfy a wings craving and sneak some beans into your day. Traditional refried beans use lard, but this vegan version is just as delicious. Use it to make that Mexican Pizza from earlier in this very list, why dontcha? Pasta e fagioli is a traditional Italian dish that translates to “Pasta and Beans.” I have fond memories of eating this dish at a friend’s house growing up, and I have missed it! Spicy chickpea curry with sweet potato is a healthy, hearty meal that comes together in a single pot. Serve it up over rice or your favorite whole grain. Homemade empanadas stuffed with a flavorful black bean-sweet potato mixture is sure to be a crowd pleaser at lunch, dinner, or your next party. This summery taco recipe is stuffed with corn, summer squash, and plenty of black beans. It only takes about 20 minutes to make these, so you can even have them on a Tuesday when you were stuck at work late. I used to love chicken tortilla soup, so I can’t wait to make this vegan version that uses red lentils as the protein. Bring on those beautiful beans! This is a copycat recipe of a bean wrap available at Tesco, and you can use any beans you want to make it. She walks you through how to veganize this vegetarian favorite. 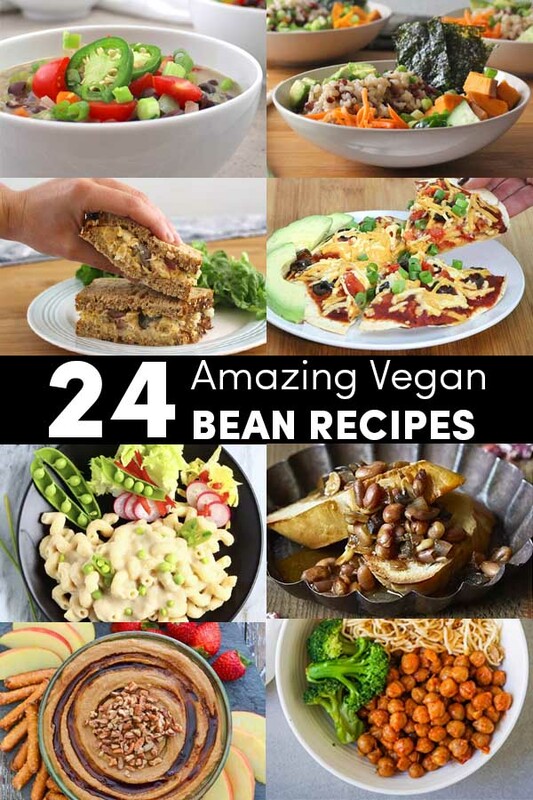 Do you have any favorite vegan bean recipes that you make often? I’d love to hear your suggestions in the comments! Yum, I love beans. Thank you for the recipes, they sound delicious!